Don’t even think about jumping back into US stocks after the recent modest sell-off. If margin debt is any guide, and historically it has been an excellent guide then what we have just seen is just a warning of a much bigger Wall Street crash around the corner. The last time margin debt was at present levels was at a previous peak in July 2007 at $381 billion, just before the global financial crisis struck. Yes it is hard to believe that confidence was that high in stocks just at the wrong moment. It is the same story now. In March 2013 NYSE margin debt totaled $380 billion. You do not need to be much of a financial analyst to spot almost an exact parallel. But what you should also understand is that margin debt works in both directions. It accelerates the upside in stocks by allowing punters to buy with borrowed money but then it accelerates the drop in a stock market by taking it away from them. How does it do that? Well think about it. If you owe money then you will be forced to sell a perfectly good asset in a falling market to pay off your debt, and that sale accelerates the fall in stock prices. This is the market tendency. We have to surpass such trends to move further and secure our personal investments. Online trading has become a passion. We have auto trading robots that can analyse and forecast the market movement with accuracy. Learn more here for detailed information to invest and earn profits. Besides with the bond market weakening the cost of margin debt is going up. That will also be triggering liquidation of this debt with an obvious impact on stock prices supported by this borrowing. ArabianMoney sees any rally in US stocks at this point in time as an ideal moment to get out before the real crash comes. The next issue of our popular subscription newsletter will look at how to short this market and make money when it falls (subscribe here). The current weakness in gold and silver is also a sign of a coming crash in all major financial assets. Once the weaker investment holders of gold and silver have finished selling precious metals they will continue with other assets, and margin account requirements will force them to liquidate US stocks. We think the sell-off of precious metals is almost done but it has hardly started with the overinflated US stock market. A historically high US price-to-earnings ratio still anticipates an economic recovery that is just not coming through. US GDP growth in the first quarter was revised down from 2.4 to 1.8 per cent, after the negative fourth quarter. 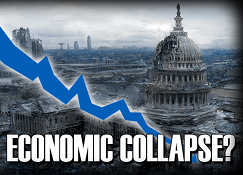 The only economic recovery is in house prices and the stock market, both inflated by cheap money courtesy of the Fed. Rising mortgage rates are going to ditch the housing recovery and rising margin costs will do for the US stock market. Welcome to the liquidation sale of the century!